In a medium-sized saucepan, heat the butter over medium-low heat until melted. Continue to cook the mixture over medium heat, until it turns a light golden-brown color. In a medium-sized pot, heat the milk until it is about to boil. Add the milk to the butter mixture slowly and whisk continuously until the ingredients are smooth. Cook the mixture for another 10 minutes, stirring constantly, and then remove the sauce from the heat. 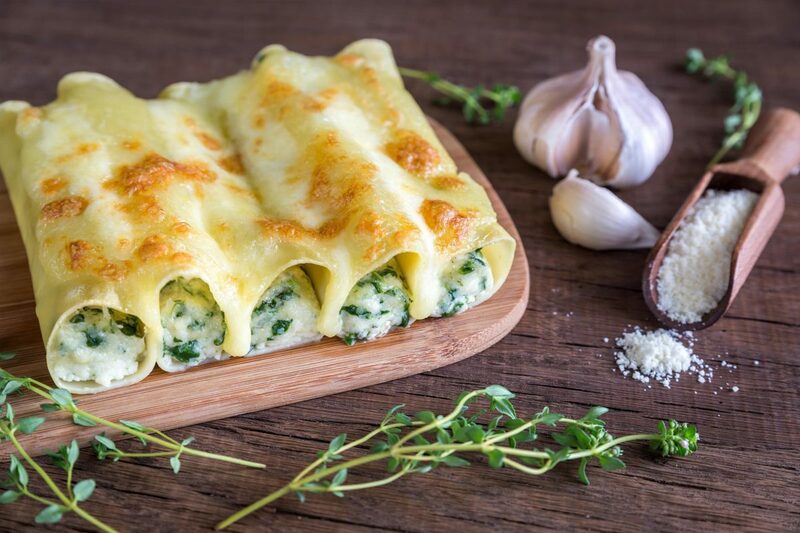 Season the Béchamel sauce with salt and nutmeg and set aside until the spinach and ricotta cannelloni is ready. Heat the olive oil in a pan and add the garlic, cooking it until soft. Add the chopped spinach and parsley and continue stirring until all the liquid is evaporated. Let the spinach mix cool. In a large bowl, combine the spinach mixture with the ricotta and Parmesan. Season the mixture with sea salt and fresh ground pepper to taste. Cook the cannelloni in boiling, salted water. Once soft, place the cooked cannelloni on wet paper towels. Spoon the spinach and ricotta mixture on each cannelloni. Pour half of the Béchamel sauce on the bottom of a large casserole dish. Arrange the 8 cannelloni in the casserole dish and spread one the rest of the Béchamel sauce on top. Season and bake the cannelloni in the oven for 15 minutes. Plate the cannelloni and top with more grated Parmesan if desired.